Having conquered the musical world with their singles, albums, tours, and cheeky grins, the Beatles turned their attention to the world of film. Their manager, Brian Epstein, had signed them to star in and provide the soundtrack for a new movie. The upstart Beatles, not willing to put their names and reputations behind anything they didn’t in some way control, chose Richard Lester as the director because they admired his short, surrealistic comedy films. The Beatles had seen the “rock and roll movies” that had been released and did not want to be associated with the kind of junk exploitation films that Elvis Presley was making. Yet the Beatles were exploited when it came time to do the soundtrack. In America, the soundtrack album was released by United Artists and contained eight Beatles originals and a handful of instrumental tracks that were used as the soundtrack to the movie. Unfortunately, this meant that America was deprived of the best album of the early years of the Beatles. There’s no denying that even on the U.S. edition those original songs are top-notch, but the inclusion of what is, essentially, four doses of Grade Z Muzak is enough to kill any album. The U.K. edition of the album is nearly flawless, an all-original collection of thirteen sterling Lennon/McCartney songs. Ringo loses his turn at the spotlight, and George is given the lightweight but enjoyable “I’m Happy Just To Dance With You.” Otherwise, this album belongs to John and, to a lesser degree, Paul. It is the first Beatles masterpiece. The single strange chord that starts the album kicks down the door in dramatic fashion and launches a song that nearly perfectly distills everything that was good about the early Beatles. It’s joyful, bouncy, full of exuberant harmonies, swapped lead vocals (Lennon on the verses, McCartney on the chorus), a crisp, exciting and very brief guitar solo, and Ringo hitting the percussion for all that he’s worth. 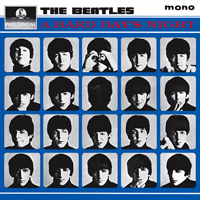 There’s simply no way to listen to “A Hard Day’s Night” without feeling better. Even the ending, with the sudden introduction of a chiming guitar lick heard nowhere else in the song, shocks the listener. The Beatles had great songs before, but this was different, a huge evolutionary leap in songwriting and performing. “I Should Have Known Better” once again features the harmonica that was so prevalent on the early Beatles singles like “Love Me Do,” “Please Please Me,” and “From Me To You,” but here it was underpinned by a driving acoustic guitar with terse electric chords and lead lines weaving throughout, and Lennon’s masterful vocal riding the wave. One of the things that makes Beatle albums so eminently listenable is that they contain a mix of slow, fast, and mid-tempo songs. “If I Fell” is one of the best of the early Beatles ballads, a song that is nearly breathtaking in it’s beauty. It’s also a sign of the rapid maturation of Lennon the songwriter. The man who just wanted to hold your hand a few months earlier now decries that naiveté, discovering that “love is more than just holding hands.” The vocal harmony of Lennon and McCartney is nothing less than astounding. George Harrison gets his turn at the microphone on “I’m Happy Just To Dance With You.” It’s far and away Harrison’s best vocal performance to this point. He sounds confident and less like a Scouse teenager. The song, written by Lennon and McCartney, is a bit of a throwaway, but by this point even their throwaways were better than almost anything else being released. And whatever sins “Dance” has are more than forgiven by the Greek feel of McCartney’s gorgeous “And I Love Her,” a ballad for the ages. “Tell Me Why” is another by-the-numbers rocker that is saved and raised to a level of greatness by Lennon’s lead vocal and the harmony vocals. A song that six months earlier probably would have been recorded very differently is now a textbook example of how to write a rocking pop song. The little guitar trills, the middle eight, the quick dash of falsetto vocal…all of these are elements the Beatles likely would not have used only a few months earlier, but their progress as songwriters was so swift that these songs almost sound as if they came from a different band than the one that recorded Please Please Me. “Can’t Buy Me Love” steals from “She Loves You” the then-revolutionary trick of starting the song with the chorus and turns the trick into art. Has there ever been a song that reached out of the speakers and so hooked the listener with the opening line? Even “She Loves You” starts with Ringo’s brief drum roll, but “Can’t Buy Me Love” immediately immerses the listener in McCartney’s go-for-broke vocal. What often goes unnoticed is that it is the bass and drums that drive the song. True, there’s a hyperkinetic guitar solo and a steady acoustic-based rhythm, but the bass largely fills in for the lead guitar. The second side of the LP has nothing as good as “A Hard Day’s Night,” “If I Fell,” “And I Love Her” or “Can’t Buy Me Love,” but it remains a classic album side nevertheless. Lennon solidifies his hold on the album as the lead vocal on five of the remaining six songs. This is a heavier slice of Beatle music than side one, containing no real ballads. This makes A Hard Day’s Night the hardest rocking album of the early period. In fact, while the Beatles would go on to record harder songs, this album may be the most consistently hard rocking of their career. A Hard Day’s Night is Lennon’s triumph. It’s the album he had the largest impact on until the White Album in 1968. The whipping pace of side two, led by the one-two punch of “Any Time At All” and “I’ll Cry Instead,” the propulsive acoustic guitar workout “Things We Said Today” (one of McCartney’s best early tunes, featuring one of the best middle eights in Beatle history), and the closing triptych of “When I Get Home,” “You Can’t Do That” and “I’ll Be Back,” leaves the listener exhausted and breathless from the sheer exuberance of the Lads. While side two has no Beatles classics (from a popularity perspective, not a songwriting/performance perspective), it completes an album that surpassed With The Beatles to become the single best example of a rock and roll album to that point. Mojo—Tom Petty And The Heartbreakers. After a lot of time wandering in the wilderness in search of real inspiration, Tom Petty has come back with his strongest set of tunes since 1994’s Wildflowers. That’s not really saying much since this is only his fourth album in 16 years, but that doesn’t underestimate the strength of these albums. What’s interesting on Mojo is how Petty has reclaimed his muse by going back to his roots. There’s a strong bluesy feel to a lot of this, but the best tracks on the album are the ones that are the strangest in terms of Petty’s repertoire. “First Flash of Freedom” features an extended psychedelic instrumental section that sounds like the Doors jamming on an alternate take of “Light My Fire,” with Mike Campbell channeling Robbie Krieger. “The Trip To Pirate Cove” uses a ghostly backing vocal to augment a haunted tale. “No Reason To Cry” is a countrified ballad, and a beautiful one. “I Should Have Known It” is a bruising rocker. On the other hand, “Don’t Pull Me Over” simply proves that Petty should steer far away from reggae, “U.S. 41” and “Lover’s Touch” are strictly compose-by-numbers, and “Something Good Coming” is a decent ballad that never goes anywhere. Clocking in at over an hour, Mojo is about 15 minutes too long, but is still a worthy listen, thanks mainly to Mike Campbell’s excellent guitar throughout and the bar-band spirit that the Heartbreakers manage to inject into the songs. Tons Of Sobs—Free. It is immediately apparent upon listening to Tons of Sobs that the début album by Free was logging a lot of time on Jimmy Page’s turntable in 1968. While most knowledgeable music fans know that Page borrowed an enormous amount of sound from Jeff Beck’s Truth, the debt that the mighty Zeppelin owe to Free is a less well-known story. After the Moody Blues-ish opener “Over the Green Hills, Part 1” Tons of Sobs explodes into a molten meltdown of British blooze, led by Paul Kossoff’s ferocious guitar playing and Paul Rodgers’s impassioned and soulful vocals. “Worry” features jagged, circular guitar lines that will shred your eardrums, and there’s a terrific version of Albert King’s “The Hunter.” While most of the songs suffer from the sameness of sound and performance that dogs a lot of the Brit blues albums of the late Sixties, there’s no denying that each track represents this mutant strain of heavy blues at a peak, and the album as a whole doesn’t have time to get boring since it begins and ends in less than 40 minutes. What this album represents is a template for what heavy rock would sound like in the 1970s. While other bands may have taken the sound further and done more with it, the debt that bands as diverse as Zeppelin, Black Sabbath, Deep Purple, and Foghat owe to Free is enormous. And Free had a better lead singer than any of those bands, and a guitarist who could hold his own with any of his more famous peers. Taj Mahal—Taj Mahal. L.A.’s Rising Sons were considered one of the can’t miss bands of the club circuit, gifted with the extraordinary guitarist Ry Cooder and, in band leader Taj Mahal, a vocalist with more grit and soul than any of his peers. Despite some fine recordings, however, The Rising Sons never hit. Ry Cooder went on to a semi-legendary career playing with nearly everyone under the sun, and Taj Mahal became the oddest of birds: a blues cult artist. Despite a great reputation with the critics, Taj never had mainstream success as a blues player because his music included everything from folk to world music. But in 1967, the début album was a straightforward collection of great blues tunes featuring sublime slide guitar from Taj, extraordinary lead guitar from Jesse Ed Davis, and the virtuoso Ry Cooder playing rhythm. Add in a rhythm section that practically defines the term “in the pocket,” cover it with the magnificently gruff vocals by Taj, and you’ve got one of the single best blues albums you’re ever likely to hear. There’s only one original song, “E Z Rider” but the covers are smartly chosen to highlight the band. Taj sets up Blind Willie McTell’s “Statesboro Blues” and delivers a hit to the Allman Brothers who stole his arrangement. Robert Johnson’s “Dust My Broom” gets a passionate reading with stinging slide guitar worthy of Elmore James. “Leaving Trunk,” “Everybody Got To Change Sometime” and “Diving Duck Blues” are electrified translations of the acoustic country blues of Sleepy John Estes, and Sonny Boy Williamson’s “Checking Up On My Baby” gets sped up and swings like a Louisville Slugger. At nearly nine minutes, “The Celebrated Walkin’ Blues” drags a bit, but only a bit, and that drag is a smallest of nits to pick on an otherwise extraordinary album.